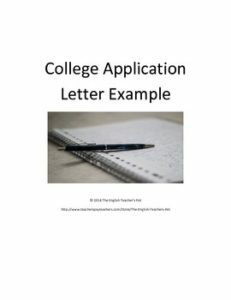 This application letter is ready to review as a good example for college admissions! In teaching my juniors how to create their own letter for their college applications, I re-created my own college letter. It is less than five hundred words (standard length colleges and universities are asking for) and answers several general questions of telling Admissions more about yourself, what kind of experiences you may bring to the campus, what inspires a student to lead… it even can be used as an example for private colleges with religious affiliations. How to Write College Application Essays with Example and Assignment. Your Writing Process Essay Assignment, Example and Rubric. Paragraph and Essay Structure PowerPoint.